Discovering Our Family History—register here to gain access to private blog content and to comment on blog posts. Climb Our Family Tree—register here to view Living individuals in the family tree. Two separate accounts are necessary because these areas of the website use two different software applications (WordPress for the blog, and The Next Generation of Genealogy Sitebuilding for the family tree), and these applications unfortunately do not currently share login credentials. You are encouraged to register for these two accounts with the same user name and password to simplify things. You can register for one, both, or neither of these accounts—it is up to you. If you change the password of one user account, it will not change the password of the other account. Left to right: Bertha Marie Tonnesdatter Olson, unknown male. Is the gentleman on the right Amund Olson, husband of Bertha? Can anyone identify the make and model of the car? Bertha died in 1904, so that narrows the search dramatically to the Veteran era. This car on flickr appears to be similar. Bertha Marie Tonnesdatter Olson (1837-1904) is 3rd great-grandmother of MKS in the Wetherbee branch. Milton Thomas Spratlin, grandfather of MKS, is named after Thomas Milton O’Kelley with his first and last names reversed. 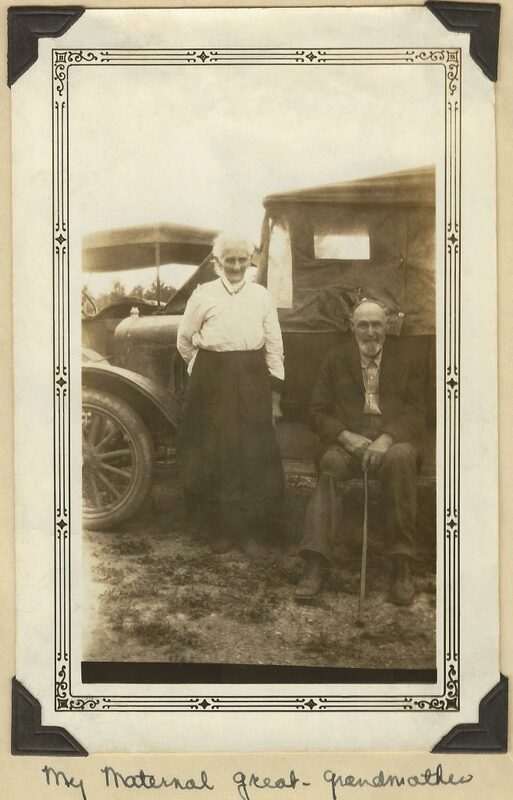 Thomas Milton O’Kelley (1855-1920) is 3rd great-grandfather of MKS in the Spratlin branch. (2) his grandfather was Rev. Ezra Adams (1788-1871) of the Robert Adams (born Hampshire, England, 1602-1682) family. 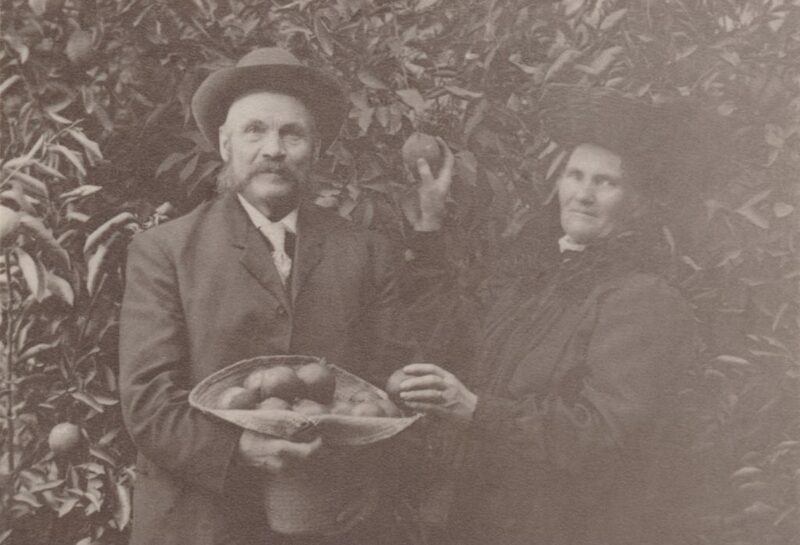 Alpheus James Adams and wife Ellen Jane Hannah Adams, picking oranges in California, abt. 1906. 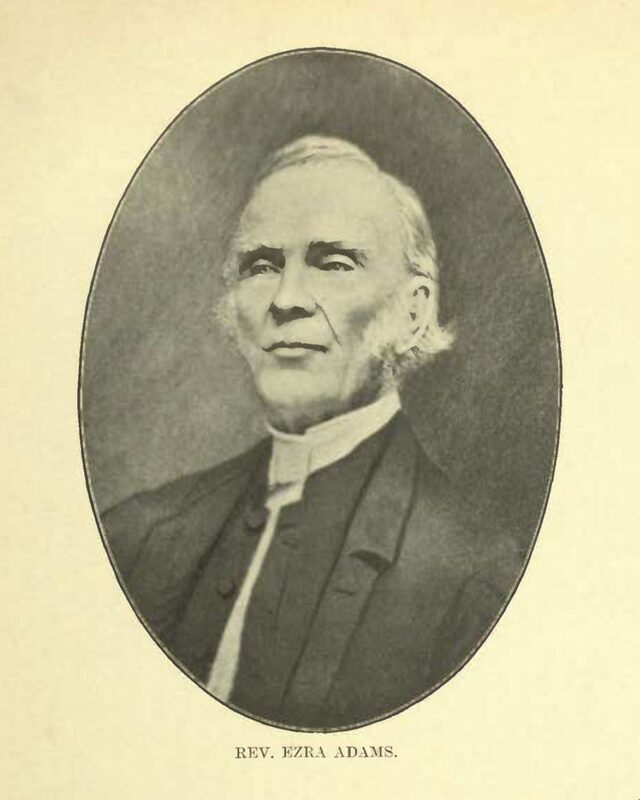 Our research of records from Manvers, Durham County, Ontario; Grey County, Ontario; and Cavalier County, North Dakota indicated that Alpheus is probably a member of the Rev. Ezra Adams family, but did not confirm this, nor determine his parents. Subsequent genetic genealogy research has now confirmed this lineage. Centimorgans (cM) is a unit of measure for the length of DNA. Each of these matches has an above 50% likelihood it was inherited from a single recent common ancestor. 8C1R means 8th cousin 1x removed, 5C means 5th cousin, etc. While a single DNA match at 50% likelihood could still not prove anything, 5 matches provides high confidence we have the correct family. Additional matches with lower likelihood have also been identified, all consistent with this conclusion. Perhaps equally important, no matches have been identified to the Edward Adams family. The first two matches listed are from Isa Proctor’s (Rev. Ezra Adam’s first wife) branch of the tree. So, we can further conclude that Alpheus is a descendant of Rev. Ezra Adams’ first marriage, not his second. Work still remains—who are Alpheus’ father and mother? The historical record leans toward Rev. Ezra Adams’ son Henry Proctor Adams (1822-1882). There are a significant number of DNA matches on Alpheus’ branch of the tree that can not be attributed to the Adams branch of the tree—these matches must be from his mother’s branch of the tree. So, this avenue of research is still open. And with Alpheus’ immediate lineage half confirmed, we can research the Adams and Proctor branches of the tree without worry it will all be for naught. In an upcoming post, we’ll look at Alpheus’ ancestors immigrating from England to New England in the 1600’s, most as part of The Great Puritan Migration. 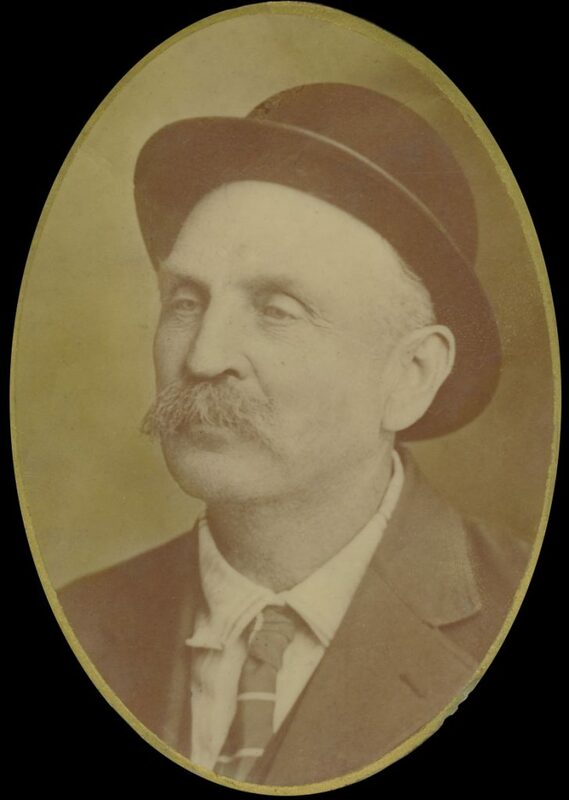 Alpheus James Adams (1845-1910) is 3rd great-grandfather of MKS in the Watne branch. They Live Where? They Can’t Live Nowhere! Where (location, place, position) is obviously important in genealogy. It literally defines where we came from, where life events occurred, where we will die, and, most importantly, it determines where we look for family records—and, without records, genealogy is a fool’s errand. But where can be confusing. Is Cavalier, North Dakota, in Cavalier County? No, it is in Pembina County. Hannah is in Cavalier County. And is it really a one hour drive from Macon, Georgia to Macon County, Georgia? Yes, it really is. There are over 2,300 distinct places in our family tree today. And that is before we misspelled most of them, creating more places in the family tree than there are family members. How does Google (or Bing, or Apple) know where to drop those pins? And does a place exist, or did it exist, if Google Maps does not say it does, or did? If we want to research the Hannah family from the Watne branch of the family tree, we have to spend a lot of time crawling through the 1851 Census for Manvers in Canada. Where in Canada is Manvers? Well, that is a trick question, as Canada did not yet exist in 1851. Canada was formed in 1867. Manvers was a township in Durham County in Canada West (think Ontario) in the Province of Canada, a British colony. Detail matters when we are talking where. Where is Manvers, according to Google Maps, typing in exactly the place name from the 1851 Census? 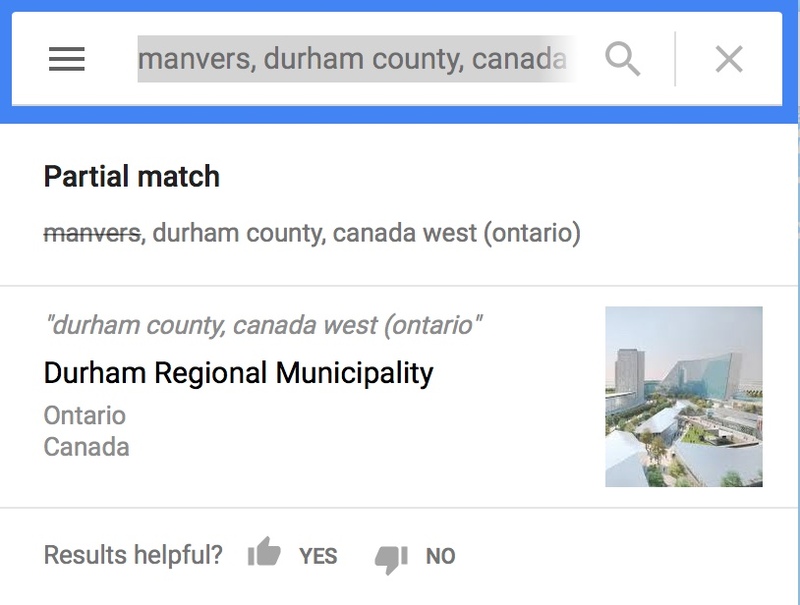 Well, Google Maps struck out the place name Manvers, and instead returns the Durham Regional Municipality (shown below) which is a regional municipality in Ontario. 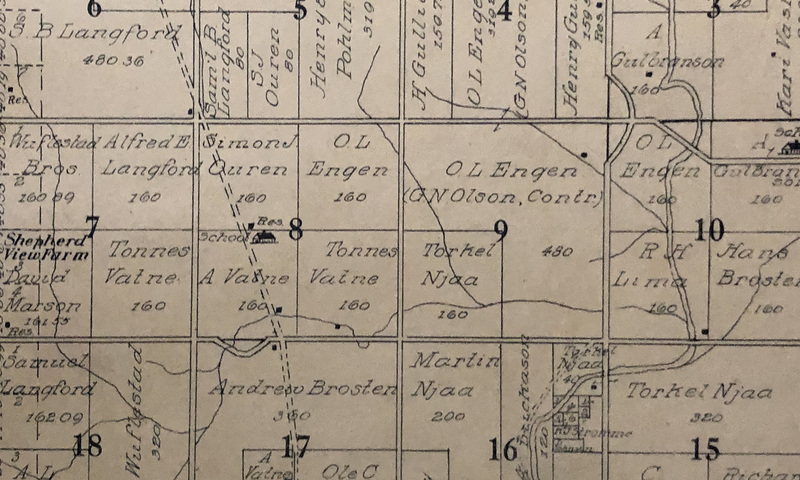 Sort of in the neighborhood, but the Manvers Township of 1851 was not even in this outlined region. As of 1 Jan 2001, it is in Kawartha Lakes at the top-middle of the above map. So Google Maps does not know, or does not want us to know they know. What if we instead ask Bing Maps , again typing in exactly the place description from the 1851 Census? Well, Bing Maps knows! The description above is exactly the where we are looking for, and it even lists Manvers Township. But Bing Maps only sort of knows, or only sort of wants us to know. Bing Maps then drops the pin at the wrong place! The pin is even further from Manvers Township than Google Maps said, or did not say. 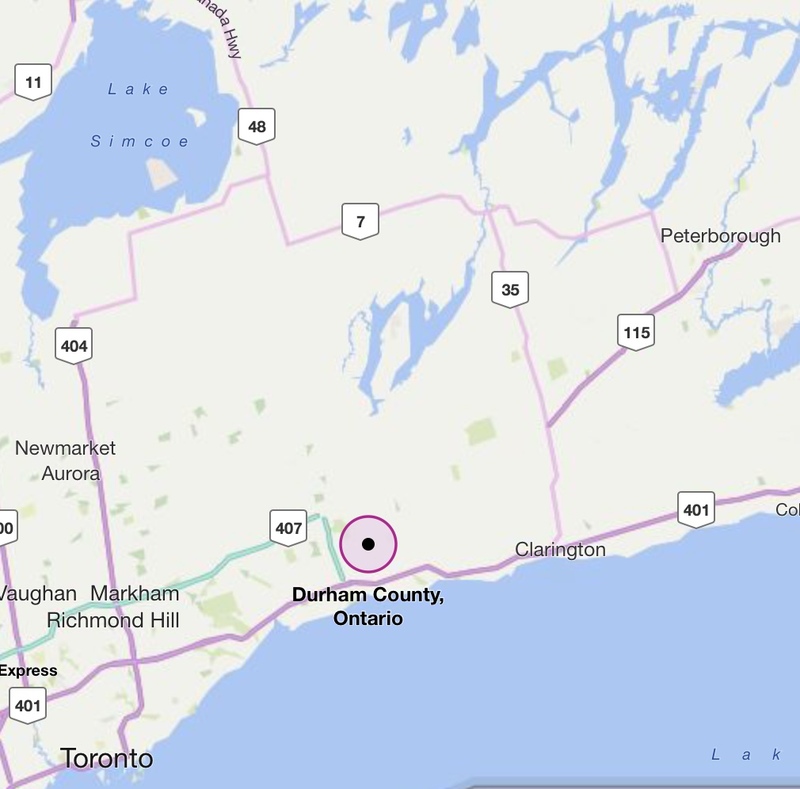 And the pin is not even in the middle of the original place Durham County, or the current place Durham Regional Municipality. And that, by way of example, is geocoding—wonderful! So, if we want to see our place pins at the right places on a map, we are going to have to resolve all the original place names that no longer exist, or that no longer exist with the same names, to the current place names. And we need to save the original place names for research purposes—the records we are researching usually list the place names of their time, or an even earlier time, not our time. How do we resolve all the original place names to current place names? There are two steps: (1) find the current place name for an original place name, and (2) change the original place name to the current place name everywhere it appears in the family tree. What magic do we use for step 1? No magic, just lots of elbow grease. Lots of web and map searches to find the right place. Original place names can be littered with alternate spellings and typos; names of nearby geographical features; names of castles, manors, plantations, and hospitals; etc. Sometimes, we have to find the original record referenced by a later reference we are using to confirm or correct the place name. For step 2, we have found the places functionality of Family Tree Maker (FTM) to be very powerful, enabling us to quickly change tens or hundreds of facts containing an original place name to the current place name, and to enter the original place name in the description field of each fact. It is not perfect, but it sure beats manually changing hundreds of facts for a single place name. FTM displays the place names in a hierarchy, making it is easy to distinguish Macon, Bibb County, Georgia, from Macon County, Georgia. We can check our work in real-time on a map that is displayed next to the editing menu. FTM also lets us enter or change the coordinates for a place name, allowing us to keep original place names, like the Kingdom of Northumbria (a kingdom in northern England and southeastern Scotland, 654-954 A.D.), and drop the pin at the right place. 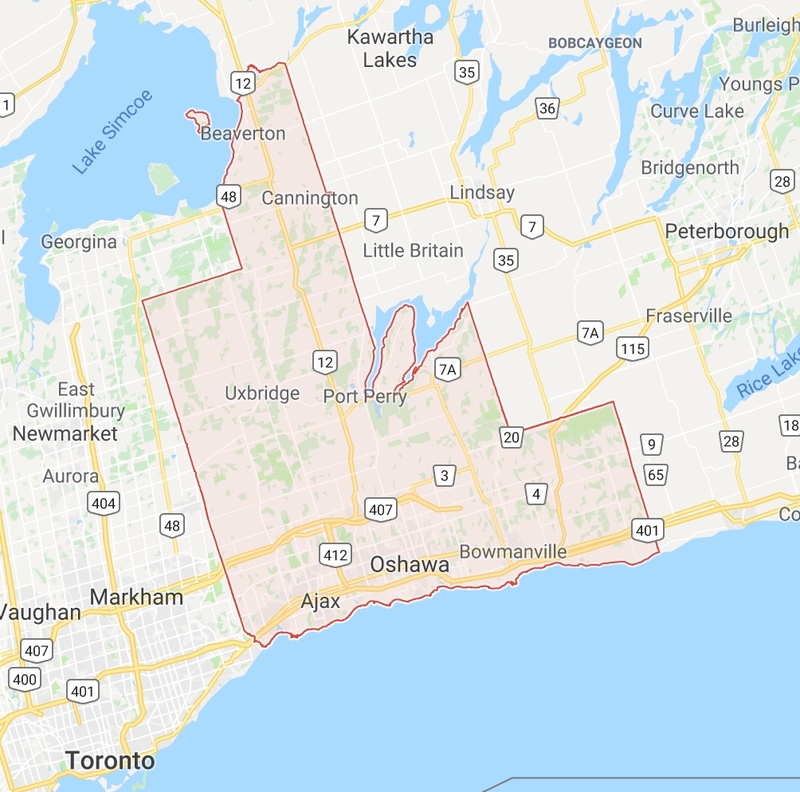 The current place name—Kawartha Lakes, Ontario, Canada— is entered in the fact location so the pin will be placed correctly on the map. And the original place name, or the part that has changed—Manvers Township, Durham County—is entered in the description field of the fact. 1852? But we are working on the 1851 Census. Well, the 1851 Census was performed in 1852. That is time, not place, and is the topic for another day. Ancestry uses OpenStreetMap, an open-sourced map. 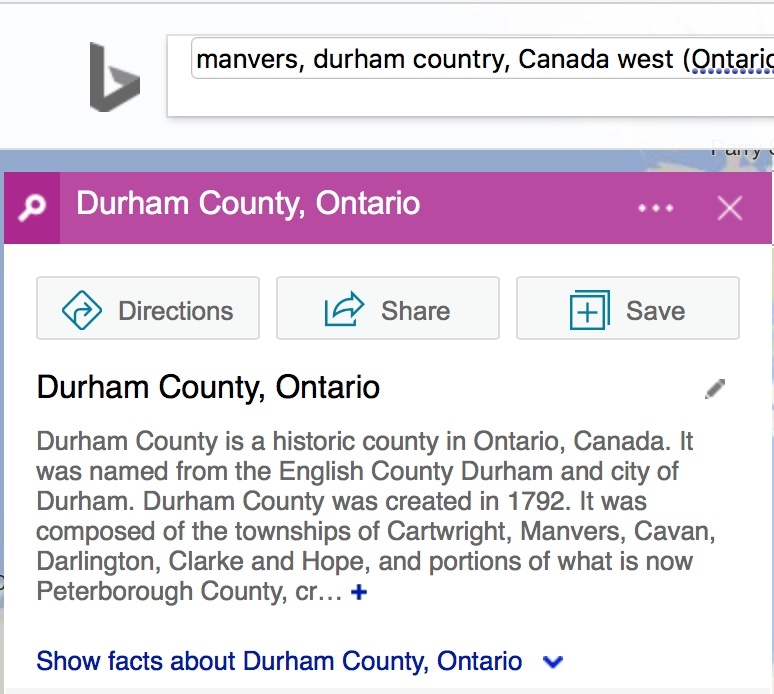 Family Tree Maker uses Bing Maps. The Next Generation of Genealogy Sitebuilding (TNG), the genealogy software used on this website, uses Google Maps. 1 world. 3 different maps. 3 different geocoding databases. So, until Google and Bing (Microsoft) and the OpenStreetMap contributor community agree to agree, we still do not always get the pin to drop on the map at the same place for a given place name as we move the family tree between Ancestry, FTM, and this website (TNG). From To Morrow, by Lew Sully, published 1898. Which family members lived in Morrow Village, Salem Township, Warren County, Ohio, USA? Yes, it is a real place. Well, no one that we know of, yet. But if we can not travel to Morrow, we can travel to Nowhere. Prefer Your Tree on Paper from Trees? Most of us still prefer paper over electrons, whether it is greeting cards (72%), being repaid in cash (67%), the option for paper bills and statements (64%), books (63%), airplane tickets (61%), and especially to-do lists—there is no sense of satisfaction in a to-do completed unless you can scratch it off your list not once, not twice, but three times with a Magnum Sharpie just for good measure. So where is your paper family tree, you ask? Well, go ahead family, ask. 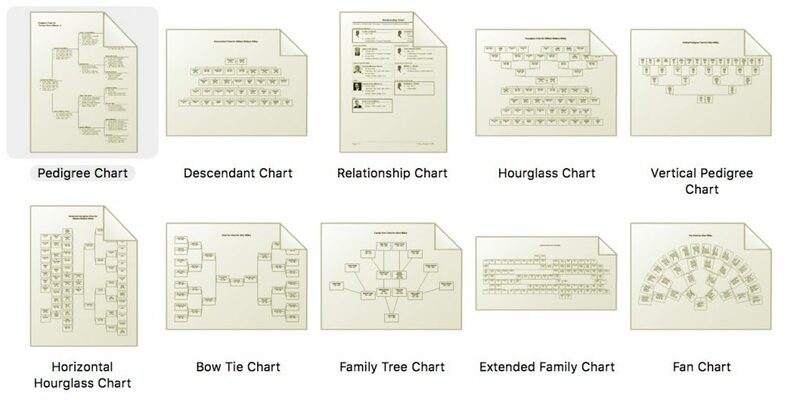 We can create a variety of family tree charts and even get them printed at MyCanvas by Alexanders, Ancestry Graphics & Printing, or several other services. Or we can generate a PDF, and you can cut down your own trees and take care of the rest. And with a little more work on your part, ok a lot, we can add pictures of family members. How much room do you have? In the Climb Our Family Tree section of this website, our family tree is stored in a database, MySQL if you must know. That endows The Next Generation of Genealogy Sitebuilding (TNG) software, integrated into this website, with superpowers—queries! Queries allow us to search the family tree for specific information that would be near impossible to find otherwise. TNG uses these queries to display reports. We’ve provided quite a few pre-built reports at Climb Our Family Tree > Info > Reports. With these reports, you can quickly find all the immigrants, twins, or war veterans in the family tree, and much more. Hint, hint … we have provided several reports that you can use if you are interested in taking on a project to research our family tree or correct obvious mistakes in its information. These reports are the ones whose names start with Help Correct … or Help Research …. That basically just says to list all the siblings in the tree that share the same birthday with one of their siblings, with some extra checking thrown in to ensure the birthdate is valid, and the list is then ordered by last name, then family ID, and then birthdate so the siblings are grouped together in the list. We also have many other reports that are used by the family tree administrator to manage the family tree (e.g. finding typos and invalid characters in names, dates, and places; ensuring living family members are indeed listed as Living, ensuring recently deceased family members are listed as Private, and countless other tedious tasks). Consider yourself spared. Many of these reports were generated by the TNG Community and can be found here. If you have an idea for a report, let us know, and we’ll see if we can find or create the needed query. Thanks to the sharp eye of Cynthia H., we have added a couple more Spratlins to the family tree—cousins Herbert Dean Spratlin and his father Frank Martin Spratlin. 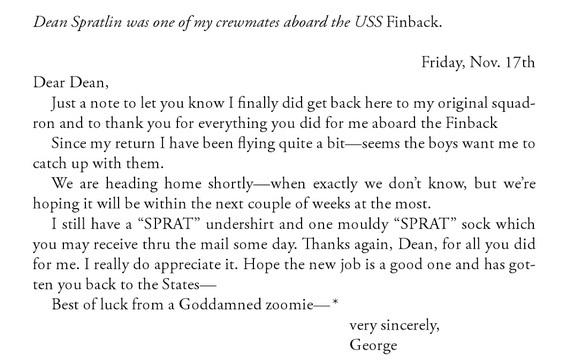 Dean Spratlin (1919-2001) was spotted in the 1984 New York Times article Bush War Record Noted on ‘A Day of Nostalgia’ recalling the 2 Sep 1944 bombing mission of 20-year-old Navy Lieutenant Junior Grade George H. W. Bush, the future 41st President of the United States. During that mission, the Grumman Avenger piloted by Bush was hit by Japanese anti-aircraft fire while approaching Chichi Jima in the Bonin Islands, Pacific Ocean, for a bombing run on an enemy radio facility. Bush completed the run, but the aircraft was too badly damaged to make it back to the USS San Jacinto aircraft carrier. Bush was able to safely parachute out, but two other aircrewmen, Radioman Second Class John Delaney, and gunner Lieutenant Junior Grade William White were killed. Bush parachuted into the ocean off Chichi Jima where he was picked up four hours later by the submarine USS Finback. There, Bush met the Executive Officer of the USS Finback, Dean Spratlin. The USS Finback was on its tenth patrol of World War II, assigned to lifeguard duty in the Bonin Islands. During that patrol, she rescued five downed Naval aviators. 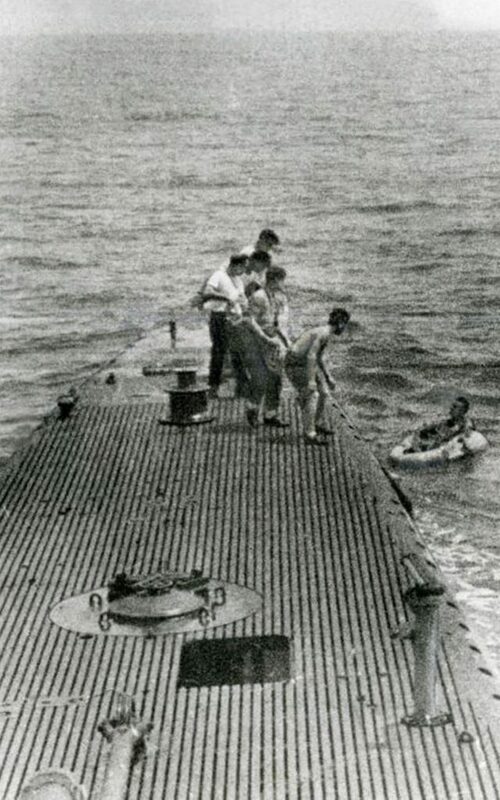 Bush being rescued by the submarine USS Finback, U.S. National Archives and Records Administration. Bush’s mission and rescue are described in more detail in this Naval History and Heritage Command article Vice President Bush Calls World War II Experience “Sobering”. Captain of the submarine USS Plunger (SS-179) from 31 Oct 1944 to 1 Sep 1945. Before the war, Dean attended the Georgia School of Technology, now the Georgia Institute of Technology, and received the M.E. degree in 1939. THWG! After the war, Dean became a real estate developer in Atlanta, Georgia. A little research found Dean’s father, Frank Martin Spratlin (1885-1961), and both were then tied to Frank’s father Dr. William Martin Spratlin (1854-1928), already in our family tree. LCDR Herbert Dean Spratlin (1919-2001) is 4th cousin 3x removed of MKS in the Spratlin branch. President George H. W. Bush is 6th cousin 4x removed of MKS in the Knight branch.